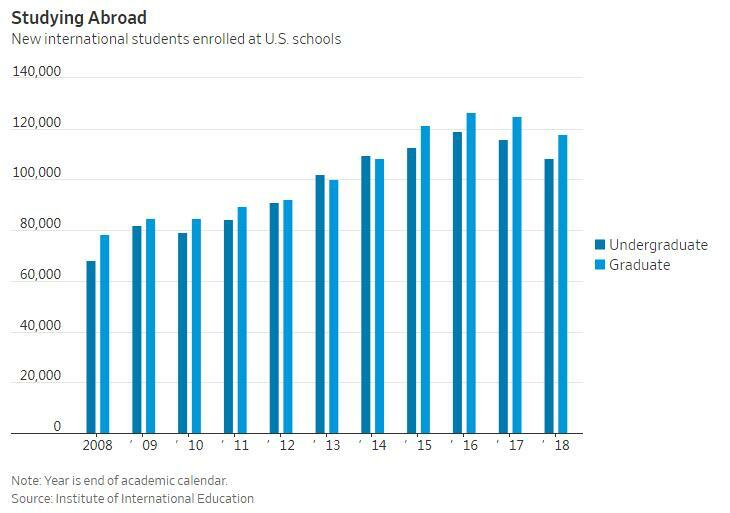 US enrollment of international students declined for the second year in a row, sending waves of unease across American colleges and universities, which see students from abroad as a buffer against the falling number of US high-school students graduating each year. The number of new international students enrolling at American institutions fell by 6.6% during the 2017-18 academic year, on top of a 3.3% decline the year before, according to a report by the Institute of International Education released Tuesday. The drop takes the number of new students back to the level seen three or four years ago. At the University of Central Missouri, foreign enrollment surged to 2600 in 2016 before plummeting to just 650 this year, according to data obtained by The AP. At Purdue University, one of the nation's biggest hubs for international students, total foreign enrollment fell by 2 percent this year. Meanwhile, the total number of international students in the US plus those working here on a student visa rose by just 1.5% this year. That was down from average annual growth of 6.1% over the past decade, a period during which enrollment of international students doubled. International enrollment fell by 4 percent following the Sept. 11 attacks in 2001, according to data provided by the institute. 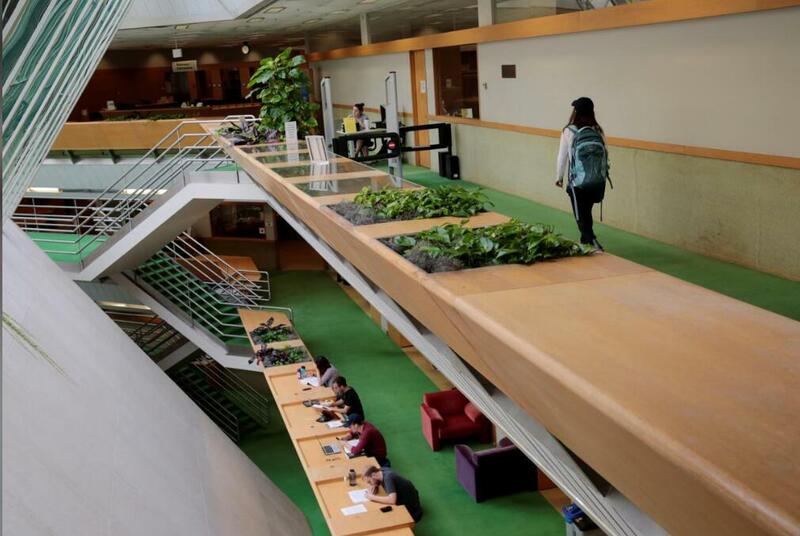 Similar to previous years, the largest numbers of students came from China, India and South Korea, which together made up 56.1 percent of all international students. The US is also losing students to English-speaking countries such as Canada, Australia and the UK, which have all seen growth in the past year. Canada reported a 20 percent jump in 2017, while Australia saw a 12 percent increase. Students from abroad are still flocking to the coasts, but are less interested in the South and Midwest. Several factors are driving the decrease. Visa and immigration policy changes by the Trump administration have deterred some international students from enrolling, college administrators and immigration analysts said. A strong dollar has made US college tuition relatively more expensive, Canadian and European universities are competing fiercely for the same students and headlines about mass shootings also may have deterred some students, said Allan Goodman, president of IIE. “Everything matters from safety, to cost, to perhaps perceptions of visa policy,” Goodman said. The shift is due to a combination of politics, geography and branding, said Alejandra Sosa Pieroni, an international recruitment expert with Ruffalo Noel Levitz, a company that consults with colleges to improve enrollment. “Students are not feeling welcome in some states, so they are looking beyond those states and heading to places where they will feel welcome,” she said. Foreign students are big business: They pumped $42 billion into US college and university coffers in the 2017-18 school year alone. International students have become an important funding source for American colleges as traditional revenue sources, such as state funding, come under pressure. Most undergraduate foreign students do not qualify for need-based financial aid and must pay close to full tuition and fees to attend US schools. Carol Spradling, director of the school of computer science at Northwest Missouri State University, said international enrollment began declining precipitously two years ago, following a “perfect storm” that included President Trump’s election with his tough talk on immigration and the shooting of an Indian immigrant worker in Olathe, Kan. The downturn, she said, had a huge impact on her school’s finances. The report also found that the number of US students studying abroad ticked up by 2 percent last year, continuing eight years of slow but steady growth. Europe remained the top destination, followed by Latin America and Asia.